Danny Hylton's late cracker was enough to earn Aldershot a first appearance in the fourth round of the Carling Cup. 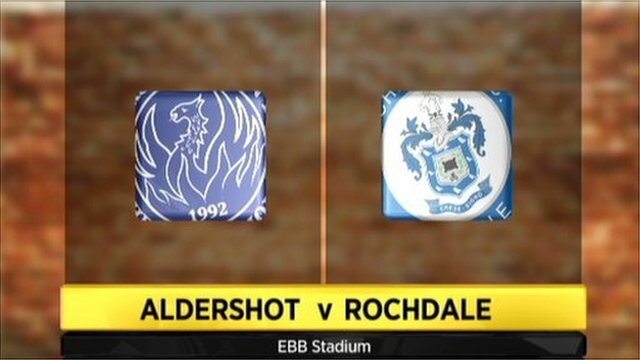 Goals either side of half-time from Rochdale top scorer Ashley Grimes and Shots striker Michael Rankine - his third of the season - looked like sending the game to extra time. But striker Hylton grabbed his fifth of the season with a sublime volley 12 minutes from time. That sent the lowest-ranked side left in the competition into the next round. Grimes almost opened the scoring in the first minute but had to wait until just before half-time to do so, grabbing his sixth of the season with a neat finish. Moments after the restart, however, the home side were level, Rankine equalising with a superb overhead kick as Dean Holdsworth's men looked to extend their unbeaten run to eight games. The Shots had already beaten West Ham and Carlisle to get this far and Hylton made sure the run continued, ending Rochdale's best League Cup run since 1962 with an unstoppable effort into the top corner. "I still think we can get better and they know it. "I asked them at half-time, 'have you got the ability to play the best 45 minutes of your lives, to write history for the football club? Do you want to be part of it? How much do you want to be part of it? And its going to take some magic. "I think they were two fantastic goals. There's a great team spirit here and I'm delighted with the never-say-die attitude." "We thought it would be won by one goal and what a good goal it was. "We have to move on, we can't mope around because it's a tough division we're in. "Congratulations to Dean and his team but we've got to get on with it." 94:02 The referee ends the match. 90:00+3:20 Ross Worner takes the free kick. 90:00+3:20 Booking Ashley Grimes is given a yellow card. 90:00+2:56 Foul by Joe Thompson on Luke Guttridge, free kick awarded. 90:00+1:47 Short corner worked by Alex Rodman. 90:00+1:10 Michael Rankine fouled by Marcus Holness, the ref awards a free kick. Jordan Brown restarts play with the free kick. 90:00+0:13 Free kick awarded for an unfair challenge on Stephen Darby by Danny Hylton. Free kick taken by Stephen Darby. 86:27 Direct free kick taken by Alex Rodman. 86:27 Booking Gary Jones goes into the referee's book for unsporting behaviour. 86:16 Gary Jones gives away a free kick for an unfair challenge on Luke Guttridge. 84:20 Unfair challenge on Brian Barry-Murphy by Michael Rankine results in a free kick. Brian Barry-Murphy takes the free kick. 83:52 Long range effort by Gary Jones goes wide right of the net. 83:15 Corner taken left-footed by Brian Barry-Murphy from the right by-line to the near post, clearance by Jamie Collins. 81:30 Substitution Matthew Barnes-Homer is brought on as a substitute for Andrew Tutte. 81:30 Substitution Brian Barry-Murphy is brought on as a substitute for Jason Kennedy. 79:27 Corner taken by Alex Rodman from the left by-line played to the near post, Joe Widdowson manages to make a clearance. 79:03 Danny Hylton takes a shot. Blocked by Gary Jones. 78:33 The offside flag is raised against Joe Thompson. Ross Worner takes the free kick. 77:27 GOAL - Danny Hylton:Aldershot 2 - 1 Rochdale Danny Hylton finds the back of the net with a goal from the edge of the penalty box to the top right corner of the goal. Aldershot 2-1 Rochdale. 76:40 Outswinging corner taken from the right by-line by Alex Rodman. 76:15 Outswinging corner taken by Alex Rodman from the right by-line, Pim Balkestein makes a clearance. 74:03 Unfair challenge on Joe Thompson by Darren Jones results in a free kick. Matthew Edwards takes the free kick. 72:38 Corner from the right by-line taken by Jason Kennedy, Jamie Collins makes a clearance. 72:07 Nicky Adams takes a shot. Save by Ross Worner. 71:04 Michael Rankine concedes a free kick for a foul on Jason Kennedy. Direct free kick taken by Matthew Edwards. 70:01 Substitution (Rochdale) makes a substitution, with Joe Thompson coming on for Jean-Louis Akpa Akpro. 67:28 Free kick taken by Jamie Collins. 67:28 Booking Pim Balkestein is shown a yellow card. 67:22 Alex Rodman fouled by Pim Balkestein, the ref awards a free kick. 65:45 Outswinging corner taken by Alex Rodman from the right by-line played to the near post. 62:08 Luke Guttridge takes a shot. Save by Matthew Edwards. 61:00 The offside flag is raised against Michael Rankine. Pim Balkestein restarts play with the free kick. 59:38 Corner from left by-line taken by Joe Widdowson. 59:38 Substitution Peter Vincenti comes on in place of Jermaine McGlashan. 58:31 Michael Rankine is flagged offside by the assistant referee. Matthew Edwards restarts play with the free kick. 55:12 Michael Rankine is caught offside. Indirect free kick taken by Marcus Holness. 53:42 Luke Guttridge gives away a free kick for an unfair challenge on Jean-Louis Akpa Akpro. Stephen Darby restarts play with the free kick. 51:03 Outswinging corner taken left-footed by Joe Widdowson, Michael Rankine makes a clearance. 50:05 Foul by Jamie Collins on Andrew Tutte, free kick awarded. Direct free kick taken by Gary Jones. 48:26 Jean-Louis Akpa Akpro produces a right-footed shot from the edge of the area and misses to the left of the goal. 46:34 The assist for the goal came from Alex Rodman. 46:34 GOAL - Michael Rankine:Aldershot 1 - 1 Rochdale Michael Rankine finds the net with a goal from inside the penalty area to the bottom left corner of the goal. Aldershot 1-1 Rochdale. 45:44 Jermaine McGlashan takes a shot. Marcus Holness gets a block in. 45:00+2:03 The match has reached half-time. 45:00+0:58 Stephen Darby challenges Alex Rodman unfairly and gives away a free kick. Alex Rodman has a direct shot on goal from the free kick. 44:30 The assist for the goal came from Gary Jones. 44:30 GOAL - Ashley Grimes:Aldershot 0 - 1 Rochdale Ashley Grimes finds the net with a goal from inside the penalty area to the bottom right corner of the goal. Aldershot 0-1 Rochdale. 42:43 Luke Guttridge has an effort direct from the free kick. 42:43 Booking The referee books Jason Kennedy for unsporting behaviour. 42:29 Jason Kennedy challenges Jermaine McGlashan unfairly and gives away a free kick. 41:49 Jason Kennedy concedes a free kick for a foul on Michael Rankine. Alex Rodman restarts play with the free kick. 41:05 Corner taken short by Nicky Adams. 40:47 Gary Jones takes a shot. Save by Ross Worner. 40:20 Michael Rankine takes a shot. Save by Matthew Edwards. 38:15 Gary Jones challenges Ben Herd unfairly and gives away a free kick. Direct free kick taken by Ross Worner. 36:46 Michael Rankine gives away a free kick for an unfair challenge on Jason Kennedy. Free kick taken by Stephen Darby. 34:32 Ben Herd has an effort at goal from close range which goes wide of the left-hand upright. 31:46 Andrew Tutte takes a shot. Save made by Ross Worner. 26:20 Ben Herd fouled by Nicky Adams, the ref awards a free kick. Ross Worner takes the direct free kick. 24:41 Jamie Collins decides to take a short corner. 23:33 The offside flag is raised against Michael Rankine. Marcus Holness takes the indirect free kick. 21:10 Corner from the left by-line taken by Jamie Collins, Close range shot by Ben Herd goes wide of the left-hand post. 19:06 Nicky Adams takes a shot. Save by Ross Worner. 17:38 Marcus Holness fouled by Danny Hylton, the ref awards a free kick. Direct free kick taken by Matthew Edwards. 14:33 Outswinging corner taken from the right by-line by Nicky Adams, clearance made by Jordan Brown. 6:55 Joe Widdowson takes a outswinging corner to the near post, Ben Herd manages to make a clearance. 5:13 Jermaine McGlashan produces a left-footed shot from the edge of the box and misses to the left of the goal. 4:22 Foul by Danny Hylton on Marcus Holness, free kick awarded. Matthew Edwards restarts play with the free kick. 3:32 Alex Rodman takes a shot. Save by Matthew Edwards. 1:04 Outswinging corner taken right-footed by Nicky Adams, Effort from deep inside the area by Pim Balkestein misses to the left of the goal.